For the first time in Bridgeport High School history, one of their DECA members has been elected as President of West Virginia DECA. 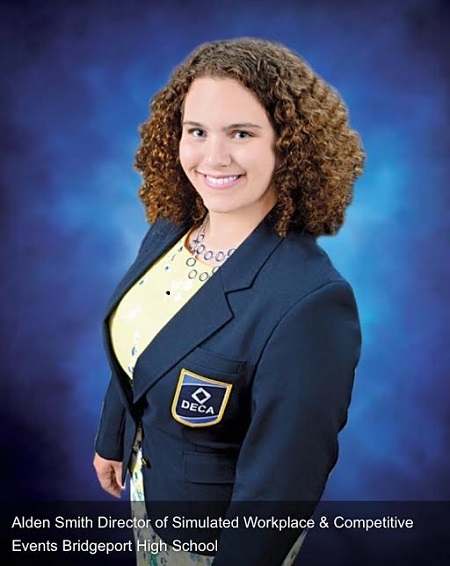 After being named President, junior Alden Smith began her reign at the closing ceremony of the West Virginia DECA Career Development Conference in Charleston on March 11. Smith, who served on the WV DECA State Action Team last year, perfectly represents all things DECA. The student organization focuses on developing professionalism, leadership skills and community relations among students interested in careers in marketing, management, finance and hospitality. As a founding member of the BHS Leadership Team, Smith has continually spearheaded projects, fundraisers and community service projects that have impacted the entire Bridgeport community. On March 10-11, members of BHS DECA travelled to Charleston to compete against over 300 students from around the state. Each student spent months preparing projects that required detailed written reports and professionally prepared presentations. Smith, along with her partner, Dakota Hitt, placed first in Innovation Plan, where they created a unique app that would improve the communications process between managers and employees. Madelyn Lalama, a BHS senior, also placed first. Her Community Service project focused on the Life League Suicide Prevention Program at Bridgeport High School. Life League began 18 months ago as a way to destigmatize mental health issues and promote self-care. Michaela Perri and Veronica Archer placed second in the state for their Business Services Operations project, which featured Bridgeport’s My Little Cupcake. After conducting marketing research on the store, they made recommendations for future growth and promotional opportunities. Dakota Swiger, Corinne Lalama, and Molly Runner placed second in the state for their Public Relations Project. Their theme was the year-long promotion of VENT, a free, confidential youth support group for those who are facing mental health issues or want to support someone who is. VENT is a partnership between BHS DECA and United Summit Center and meets weekly after school to allow teens to discuss issues and improve self-care, as guided by Marissa Shanholtz. All eight students who attended West Virginia State Career Development Conference qualified to advance to the International Career Development Conference in Orlando, Florida. The team will face competition from students in all 50 states and 9 countries the last week of April. Winners will receive scholarship and internship opportunities, but all participants will have an unforgettable experience networking with professionals in the business field. Upon their return, BHS DECA students will begin preparing for next year’s competition, starting with their first community service project, a county-wide mental health fair. Students work year-long with area businesses and civic organizations in order to best represent Bridgeport on the state and national stage.